The GammaPod ™ – a first-of-its kind stereotactic radiotherapy system to treat early-stage breast cancer – has received 510(k) clearance from the U.S. Food and Drug Administration (FDA), paving the way for the manufacturer to bring the system to market for the treatment of breast cancer patients. “We believe this novel radiotherapy system has the potential to change the paradigm for treating early-stage tumors, negating the need for surgery for some patients,” says GammaPod co-inventor William F. Regine, MD, FACR, FACRO, the Isadore & Fannie Schneider Foxman Endowed Chair and professor of radiation oncology at the University of Maryland School of Medicine (UMSOM) and chief of radiation oncology at the University of Maryland Marlene and Stewart Greenebaum Comprehensive Cancer Center (UMGCCC). “With this breast-specific treatment system, we will be able to deliver high-dose radiation to a tumor while minimizing damage to normal breast tissue and even more importantly, to major organs such as the heart and lungs,” Dr. Regine says. With advances in imaging and better screening, most breast cancers are diagnosed at an early stage, when the tumor is confined to the breast or nearby lymph nodes but has not spread to distant parts of the body. Patients typically have breast-conserving surgery to remove the tumor (and any lymph nodes where cancer is detected), followed by three to six weeks of radiation. Invented by scientists at UMSOM, the GammaPod system has been under development for nearly a decade. The prototype was installed and tested at the University of Maryland Medical Center (UMMC). Armed with data from a feasibility and safety study, Xcision Medical Systems, a Columbia, Md.-based company that manufactures the GammaPod, sought permission from the FDA this fall to begin marketing the system to hospitals and other medical facilities. The FDA granted the company 510(k) clearance today. Radiation oncologists at UMMC expect to be able to offer the treatment to breast cancer patients in spring 2018. 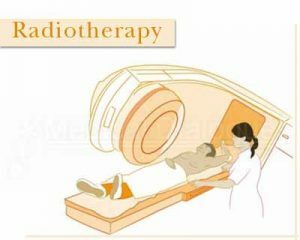 Stereotactic radiation therapy is most commonly used to treat brain cancer and cancers in other parts of the body, such as the lung, spine and liver, where it is called stereotactic body radiation therapy, or SBRT. It delivers a high-dose of radiation directly to the tumor, sparing nearby healthy tissue, in far fewer treatments than standard radiation therapy. The GammaPod enables this technology to be used for breast cancer. The GammaPod system targets a tumor with thousands of precisely focused beams of radiation from 36 rotating sources. A patient is treated lying on her stomach with her breast immobilized by a patented vacuum-assisted cup, which is locked into the treatment couch. The couch moves during treatment as radiation “paints” the tumor. Treatments take five minutes to 40 minutes, depending on the therapy plan. The machine gets its name from the type of radiation (gamma rays) and the pod-like shape of the machine. As part of the FDA review process, UMSOM investigators submitted data from 15 patients treated with the GammaPod in a feasibility and safety study, starting in early 2016. Patients received a single “boost” treatment with GammaPod to the site where their tumor was removed, along with three weeks of traditional radiation treatments to the whole breast. The total treatment regimen was reduced by three to four treatments. Initial results indicate that the GammaPod system can deliver radiation to the breast safely, according to the study’s principal investigator, Elizabeth M. Nichols, MD, an assistant professor of radiation oncology and clinical director of the Department of Radiation Oncology at UMSOM. “The GammaPod delivers a uniform dose to the tumor but the amount of radiation drops off rapidly outside the targeted area with a substantially reduced dose to healthy breast tissue. We believe that this reduced exposure will result in better cosmetic outcomes for patients,” says Dr. Nichols, a radiation oncologist who treats patients at the UMGCCC and the Maryland Proton Treatment Center. In upcoming clinical trials, researchers will investigate various ways to use the GammaPod before and after surgery, gauging its effectiveness in reducing the size of a tumor to be removed or giving a sufficient dose to destroy it. They will also seek to identify subgroups of patients who may not require surgery after treatment.